Come enjoy spring fishing with us at Big Rock Resort. Park your boat in our protected harbor and let us clean your fish for you! Take advantage of reduced rates and spring specials! Now offering 3 nights for the price of 2 nights for the week of Memorial Day in any of our Cabins or Lodge units! Come enjoy time with your family and friends making memories. Don't delay call today! Memorial day special rate for cabins! Two nights $229/night. 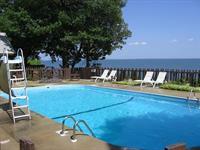 Three plus nights $179/night. Additional discounts for longer stays. Our newest cabin sleeps 20-24 people. Book a full week in June and receive a free 19' Pontoon rental for the week. Our four bedroom lake homes, Heritage and Shoreview are two stories with walk out basements. Able to sleep ten to 16 guests they are both large with two bedrooms, living room and bath on each level, giving you plenty of room to spread out. 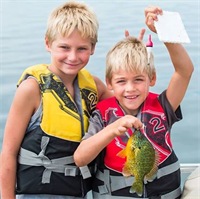 Our resort offers, Heated Pool, Sandy Beach, Activities, Bon Fire Pits, Playground, Bingo and so much more fun for the summer fishing family. Free 19' Pontoon with weekly rental. Pet's Welcome.